The title alone made it a job to aspire to. Blogger-in-Residence at the Brighton Royal Pavilion and Museums. By my reckoning, that makes me about one step down from Royalty. Sadly even dream jobs have to come to an end and after six months, it’s time to hand over the title of Blogger-in-Residence to a new blogger-in-waiting. For the last six months, I’ve felt extremely lucky to have been given special access to all aspects of the Royal Pavilion and Museums. I’ve wandered around the galleries, delved into underground tunnels and discovered new places in a city I thought I knew very well. Blogger-in-Residence Caroline Sutton in the tunnel between the Museum to the Dome. I’ve also met some fascinating people who are passionate about their subjects whether it’s gilding on paintings or helping some of the most disadvantaged people in our city to access our city’s treasures just like everyone else. As Blogger, I’ve delved into such an array of subjects such as WW1, female artists and the immortality of a tiny sea-creature called Connie. I thought the role would be interesting but what has most surprised me is the huge eclectic mix of subjects and stories the museums encompass. The world really is all in there from the beautiful and shocking Grayson Perry vase to the passion around football in a tiny village in Africa to the heartbreaking final letter of a son to his family in WW1. The Royal Pavilion is marvellous, of course but my eyes have been opened by the endless, moving shows which take place across Hove Museum, The Booth, Preston Manor and of course, Brighton Museum. Forget the idea that museums are old-fashioned dusty places. The Royal Pavilion and Museums is a vibrant, multi-faceted, pulsing world of energy. Beneath the cool, calm façade is a host of busy, busy people planning, talking, creating and uncovering great art and history to share with us. And they do want to share it, with all of us. It’s not about clever academics caught up in an ivory tower. Instead all the people I’ve met are desperate to show the rest of us the fascinating stories behind the items in the collections. My role was to write whatever I like about the buildings, staff, collections and anything which I’m inspired by. I’ve written about the psychology of collecting, The Keep where the cities archives are kept, a WW1 drama performance by young people, taking children to museums and the art of designing a museum show. And what was in The Disaster Cupboard. I’ve also created some Pinterest boards of all the things I’d like in my own house from the Royal Pavilion and the Brighton Museum art and craft collection as well as tweeted and blogged about football when England were knocked out of the World Cup. I’ve met lots of the people who visit the museums and asked them why. Some groups of people don’t think of a museum as part of their lives. They’d never step inside, sometimes through fear, apathy but mainly a sense it’s nothing to do with them. It’s shocking but many born and bred Brighton residents have never been inside the Royal Pavilion despite its silhouette representing Brand Brighton in every council logo. Like most people I have no specific knowledge about art or history. When I look at a painting, I’m not sure if I’m getting it. So I wrote a post about how little I know about art and I met up with the Fine Art keeper who gave me a master class on looking at art when you don’t know anything about it. My interest in history has been patchy too. I can be as bored as the next person when faced with a room filled with artefacts. So I considered it my job to find the interesting in the galleries and bring it alive. To be honest, it’s not that difficult. Museums are not like they used to be. They are much more fun, irreverent and entertaining. There’s less to read and more interactivity. They’re in the business of entertainment these days as much as education and research. Museums have to sing for their supper to get grant funding and they need to illustrate they are reaching their targets. Like all organisations, they need to have a strong digital presence too. And that’s why this post can help keep these institutions alive. As Blogger-in-Residence (it’s OK, you can stop curtseying now) I’ve tried to muscle my way into the social conversation to say, come along and visit. These museums aren’t boring, they are for you too and I can guarantee you’ll find something of interest when you come along. There are still many corners of the museum I’ve yet to visit and explore. I’ve fallen in love with Preston Manor and urge you to visit if you haven’t yet. I wanted to find out more about the craft collection at Hove Museum. I didn’t even touch the surface of the Booth Museum collections some of which made me feel tearful in their fragility and beauty. I’ll leave them to the next Blogger Jools Stone who is lucky enough to be spending the next six months exploring RP&M his way. Good luck Jools, you’ve just landed the best job in town. There was no alternative. I had to sit down on the floor and look a little longer. A photo by a group of Brighton youngsters and German photographer Jan Von Holleben had me stumped. Called The Amazing Analogue: How we play photography, the exhibition of photography is a new exhibition at Hove Museum exploring the playful side of picture making. They are a group of young people from Brighton and Hove who worked with von Holleben at the museum. 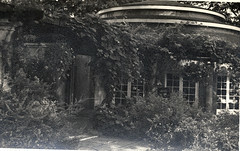 Their starting point was the photography collection which documents the pioneering work of early photographers in Hove. Von Holleben discovered a dusty old box of slides and negatives which he showed to the children in order to inspire them and get them thinking. The images are curious – shapes and textures which are beautiful and colourful. From those images, the groups started to create machines which echo the early cameras and projectors in the museum collection as well as the shapes in the old images. Using modern bits and pieces from machines and general life they have created some incredible looking, almost Heath Robinson style creations, which are ‘designed’ to view the images. But that’s where I’m stumped – I’ve no idea how they have managed to create such visual tricks – there’s a peg bigger than a boy. A huge light bulb hangs from a table. The children appear to be operating a machine made out of a mobile phone as big as them. The images are playful and intriguing. I can see some of the tricks are produced by the use of perspective but it’s hard, knowing there is no digital manipulation to understand how each image is created. I sat for a long time, analysing how each machine was manipulated by a camera, with no clever computer tricks to create the effects. Photographers may know the answers but I left with little idea of the mechanics behind the trickery. I don’t really mind. It doesn’t detract from the beautiful, intricate and entertaining images. This show is part of the Brighton Photo Biennial 2014 called Communities Collectives and Collaboration which runs until November 2. There are a series of events, shows, talks and screenings happening across the city organised by Brighton-based Photoworks.